The Watergate Hotel, with its fortress-like architecture, has been empty since 2007. 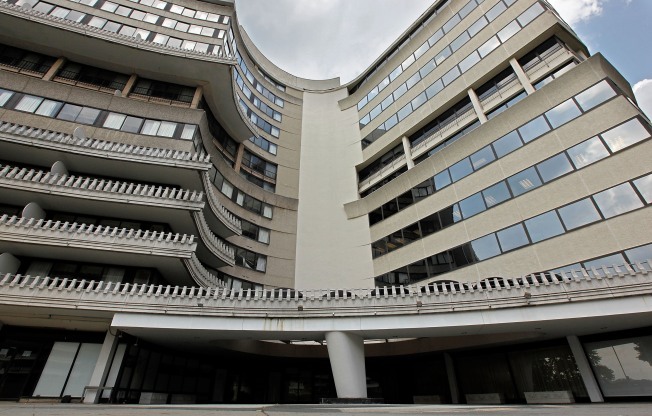 No one bothered to bid on the Watergate Hotel during an auction last month, but now it looks like there is interest in the infamous landmark after all. Six hotel chains are looking into the property that went on the bidding block at $25 million, according to the hotel's owners PB Capital, DCist reports. The interested parties' execs are currently touring the Watergate to determine how much it would cost to renovate the property, said Kurt Sachs, senior managing director at PB Capital. PB Capital, which owns a $40 million note on the Watergate, bought the hotel at the July auction after foreclosing on its debt-ridden owners Monument Realty. In addition to the price tag, a few reports have put at least a $100 million price tag on renovations to make the hotel's 251 odd rooms habitable. Either way, the first person who gives PB Capital a check gets the hotel, Sachs says. The Watergate complex became famous after a 1972 burglary there led to the resignation of then-President Richard Nixon.